Welcome to the fourth newsletter from the EU funded POP Centre of Excellence. Our free of charge services help EU organisations improve performance of parallel software. Everybody is welcome to attend our User Forum. This workshop is aimed at POP users, and anyone interested in learning about the POP project and services. It will include talks from POP about our services and from users about their experience of our work, with plenty of opportunities for your feedback. Registration is now open, for more information see the POP website. What kind of codes has POP analysed? Last June we reviewed the first 9 months of the POP project on the NAG Blog by analysing the kind of codes investigated by the project so far. Now we have completed 18 months of POP work it seemed a good time to update this analysis, and to review how things have developed as the project progressed. Overall some trends have remained the same. 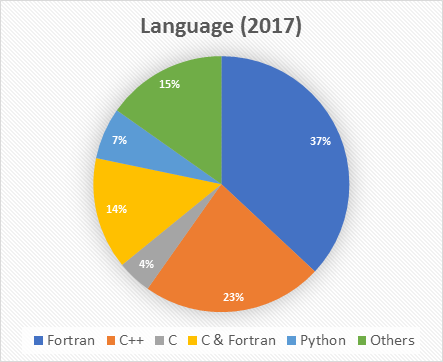 For example, Fortran is still the most popular language used by our users. At the same time, some things have changed, such as the lower proportion of hybrid MPI + OpenMP codes we are now seeing. One goal we set ourselves was to reach out to new subject areas and more EU countries, and our new data shows we have made good progress. However certain countries remain under-represented, compared to the size of their HPC market, giving us a good indication of where to focus our efforts in the next 12 months of the project. To read the full analysis see the new post on the POP blog. sphFluids is a SPH (smoothed particle hydrodynamics) cross-platform application written in C++ and OpenMP. The POP audit of sphFluids identified several issues related to computational performance, including low values of IPC (instruction per cycle). Following discussions between the sphFluids developers and POP experts, and a review of the code design, it was decided to implement a complete rewrite. This led to performance improvements of up to 6-7x, depending on the scenario and pressure model used. For the full story see the new blog post. For HPC applications it is common to profile (and optimise) computation and communication, while neglecting I/O. As a result I/O can become a significant performance bottleneck. The Darshan HPC I/O profiling tool has recently been used in a POP Audit to successfully profile I/O of an MPI code, and is a useful tool to assess POSIX I/O, MPI-IO, parallel NetCDF and parallel HDF5. 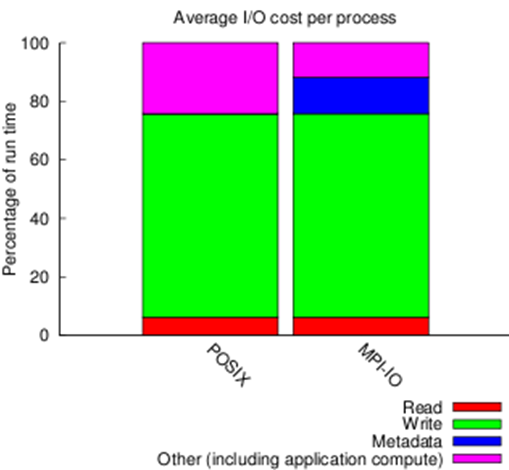 For example, the picture shows a Darshan report on % of run time in POSIX I/O and MPI-IO. For more information on using Darshan see the new blog post on the POP website. A commercial Python code using hybrid MPI + OpenMP was investigated in a POP performance audit to identify the cause of limited scalability. The performance analysis used Extrae and Paraver and determined that workload replication was the main reason for the poor performance. By applying a cluster analysis within Paraver it was possible to pinpoint the regions of code responsible. 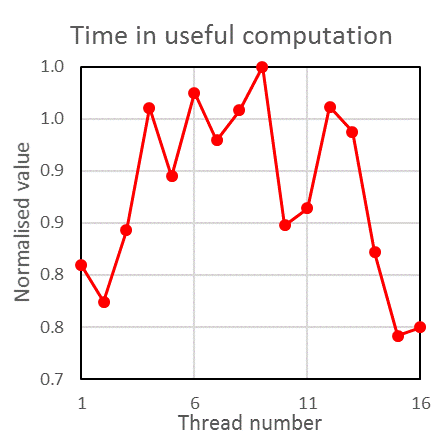 Furthermore, it was discovered that decreasing computational efficiency with increasing core counts is an additional problem. This work highlights a new feature in Extrae and Paraver that allows in-depth analysis for Python-based applications, i.e. similar to analysis of applications written in C or Fortran. Our recent analysis of a meteorology MPI code included a sensitivity analysis of MPI communication using Dimemas. 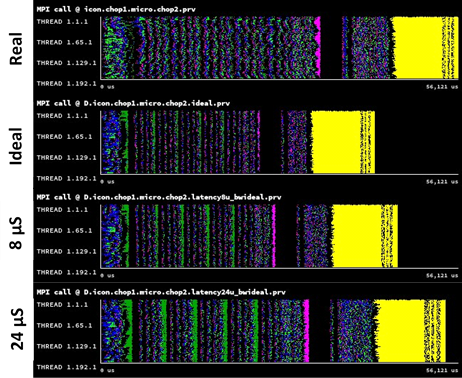 Dimemas is a performance simulation tool that uses real runtime data to simulate performance on theoretical networks. In this work, as part of a POP Performance Plan, a parametric study of latency (see figure) identified that this code shows significant sensitivity to MPI latency. Dimemas was also used to analyse the influence of the eager limit & end-point contention. The FFEA (Fluctuating Finite Element Analysis) code uses C++ and OpenMP to simulate dynamics of microscopic viscoelastic bodies subject to thermal fluctuations. A recent POP audit calculated the range of OpenMP performance metrics and identified inefficiencies resulting from IPC scaling, Amdahl's law, load imbalance and OpenMP overheads. This audit data has been used by the code developers as part of their ongoing code improvements. PRACE Days 2017 is in Barcelona between 16-18th May. This forum is for domain experts from industry and research to discuss how they use HPC to further their research. The International Supercomputing Conference (ISC) is 18-22nd June in Frankfurt. ISC is a major HPC conference held annually in Germany, and is attended by users and vendors who showcase the latest technologies and developments in HPC. Talk to POP experts at the exhibition booths of BSC, JSC/HLRS and NAG. Look out for a BoF titled “POP Improves HPC Applications” and participate! The conference also hosts many presentations on novel uses of HPC to advance scientific and industrial productivity.